The building’s architect is Bart Voorsanger of Voorsanger Architects, PC, who has distinguished himself as a master composer amid the competing melodies of 21st-century structural design. His style was first informed by the varying aesthetics of his childhood hometown, 1950s San Francisco, and he went on to earn a masters degree in architecture from Harvard in 1964. He spent three years as an urban planner for Vincent Ponte in Montreal, Quebec, and 10 years as a design associate for I.M. Pei & Partners before starting his own firm, and his lengthy curriculum vitae evinces the range of innovative styles he was able to bring with him. Originally established in 1978 as Voorsanger & Mills, the 22-member Voorsanger Architects has since conceived a number of artful monuments to human ingenuity and consonance, including LaGuardia Airport’s control tower and the Wildcat Ridge Residence. And, it has received more than 30 design awards for its internationally prominent commercial, institutional, and high-end residential work. It was in 2005 that the firm won the bidding for the master plan of the National World War II Museum, to be completed by 2016. American Builders Quarterly sat down with Voorsanger to understand his ideas on the necessity of emotion in architecture and how they played into his vision for a space honoring American soldiers. You were recently quoted as saying that every project begins as a tabula rasa. How does this idea inform your own approach to architecture? Bart Voorsanger: Starting a project, you need to empty your mind. You can’t go in with a preconception of what the design is going to be. If you’re thinking as an artist, you’ll find preconception as a cynical and antithetical way of approaching a project. This doesn’t mean an intellectual and emotional signature won’t emerge from the design, but nobody really knows what the results are going to be. When we enter a competition, everybody on the team starts completely fresh and at a very small scale. We build the project as lumps until we figure out its context, implications, environment, scale, impact, and all of the elements you automatically utilize in a project. The worst way to start a project is to come in with an idée fixe because it can choke the level of invention that is potentially there. In addition to this, you often have to consider the obvious zoning laws and building codes, normal constraints which can challenge you to another level of excellence. How did you begin developing this approach to design? BV: The origin of [such things is] literally part of any person’s emotional DNA. Growing up in San Francisco, I synthesized different influences: arts and crafts, Oriental, and Western architecture and design. I also used to mountain climb, where I developed a tremendous respect for nature. It’s healthy to understand nature and its effects on building. All of these things taught me to think about how to put things together: very carefully. Is it your opinion that architecture is inherently attached to feeling? BV: There are thousands of background buildings, and there are whole generations who believe only in background buildings—that they should be referential to a context or that signature architecture should be a rare event. This is not my focus. You have a short life. You can’t design a lot of buildings, and when you do design, you want the people experiencing that building to feel the input of it, and if there is excitement, these people should want to bring others to it. How do you make a building do this? BV: Sometimes it is very important that a building not be intrusive but defer to the larger issue of program, context, and owner aspiration. Consider the National World War II Museum in New Orleans, which we began in 2003. As a history museum, it’s fundamentally a black box. It walks you through a story line, but this walk is all within this black box. In addition to the theater in the first phase of this project, there is also a lobby and an enclosure, so the building needs to consider the exterior forms: the height of the surrounding buildings, their materiality, and how the museum relates itself to other buildings. 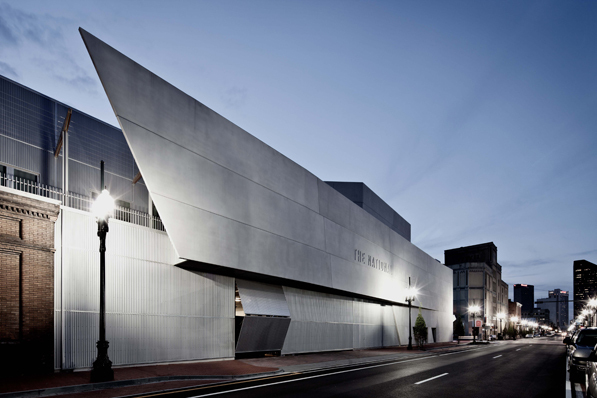 In what ways does the National World War II Museum account for these exterior elements? BV: The museum is located in the Warehouse District in New Orleans. The French Quarter is to the north, and the Garden District is to the south. The district is a compilation of two- and three-story warehouses, but none of them have the architectural character of the French Quarter. I love this neutrality because although the museum is in a historic district, the surrounding style is semi-industrial and not imposed on the architecture by the Historic District [Landmarks] Commission. The commission was concerned about height, and although one of the museum pavilions [Phase II’s US Freedom Pavilion; see the sidebar below for more info] considerably exceeds the height limitations, the others, such as the Theater Pavilion, substantially comply. The Canopy of Peace is the exception, rising 150 feet above grade, though it has also been approved. Have there been any special considerations you’ve had to make for the World War II Museum? Before our team [submitted our design into] the competition, we invited a retired lieutenant commander referred by the Pentagon who had commanded one of the landing crafts on D-Day. He was one of the two out of 100 in his boat who survived the landing at Normandy. His talk at our office was incredibly emotional—a survivor’s firsthand experience. It highlighted a vital aspect of the project that we wouldn’t have been able to understand or incorporate without his testimony. It really allowed our team to understand this other dimension—the actuality of war. Did your team run into any obstacles, financial or otherwise? BV: There are practical issues that can’t be divorced from the design. Getting funding for this project was a huge issue. When we began designing the museum, with a proposed budget of $125 million—though now its $325 million—I had a strong feeling that the money would be hard to find. Thus, our master plan would build the museum in phases, and each pavilion would have a naming opportunity, a large-scale opening event, and interstitial fund-raising efforts. One of the important aspects of the [building] geometries selected is that they are not deterministic because the outcome of war is never deterministic. At the same time, we didn’t want to design geometric fragments that become the leitmotif for the master plan. We didn’t need to invent metaphors to make the architecture work. Explain this design concept further? What specifically inspired the plans for the new Solomon Theater Pavilion? BV: Historically, the architecture of a military base is at least functional but rarely important or significant. However military museums are often built in concrete or metal and designed to feel strong. Sometimes there is the attitude that everything has to be dark because war is such a bleak event. We wanted the museum to be visually strong, an imposing scale with the precast system, rotational on the axis of each building, interlocking in shape with differing geometries for each pavilion. The geometry of the theater relates to its corner position on the site, as well as its internal use. The overall geometry is a stretch hexagon with a long axis perpendicular to the [interior] seating. The curved projection screen occupies three facets of the hexagon. [Solomon] Theater Pavilion is totally devoted to [its] film and the story the film creates. We’ve provided significant space behind the 150-foot screen to enable dynamism of the 3-D elements. The location of the theater on the corner site is an important entry from the east. Its north façade faces the original D-Day Museum, which has since become the National World War II Museum. What ideas or responses did you want the Theater Pavilion to evoke? BV: The World War II Museum is telling the story of the war differently. This museum is about how we went to war, not to glorify war but to seek the peace and liberate. As architects, we were responding to a different sort of mandate, so I wanted the building to be visually emphatic. The precast concrete—white, instead of black—is composed of 8’ x 45’ slabs that rotate around the geometry of [the Theater Pavilion], the roof portion cantilevering, gesturing toward what will be the main entry with the parade ground [inside]. The project is designed with what I call a “kit of parts,” each building using similar elements—but with different geometric strategies. How did you consider the facility’s function as a public space? BV: The public is becoming less and less interested in static museum exhibitions. They want both authenticity and entertainment. I believe the museum, in this first phase, accomplished both successfully. The 4-D theater has a film directed by Tom Hanks and produced by Stephen Spielberg. The USO area has live, authentic USO performances, and [award-winning chef and Restaurant August owner] John Besh operates the restaurant. By incorporating interspersed static exhibitions, you get a fantastic mixture of experience. It’s all about the mission of the museum, and it has been exciting for the visitors, who average up to 4,000 a day. Does the 4-D theater promote a more modern visitor experience? BV: I believe it does. It’s certainly authentic and emotionally very moving. The public [admires] the presentation. The theater itself has large internal volume but a relatively modest amount of seats . There is a lot of action in the film, which is approximately 40 minutes. The seats in the theater shake and vibrate along with the action on the screen, which is more of a scrim, and it allows you to see tanks and other equipment moving back and forth. There is a ‘snow’ that falls in the theater, representing the Battle of the Bulge. There are 10 shows a day, and they’re always sold out. What’s your own reaction to the Phase I structure now that it’s completed? Does working on a structure in pieces affect your approach? BV: An ironic aspect of architecture is that after you design, draw, and complete all of the documents, your work should be essentially done. When the building is built a few years later, you walk around it and ask yourself, “Why did I do this here? Why did I make that design decision?” Your point of view has changed during this elapsed time. We began work on the museum in 2003, and in 2012 we have only just completed the first phase, with a total target completion date of 2016. However, because of the phased master plan—which has been fortuitous for the project—we’ve been able to rethink and recalibrate our design attitude as we move through the project. Out of that has come something much more exciting and much more interesting than if we had just designed everything at one time in 2003. This project is still a living thing, and it gives people a real way to begin to understand the need for ongoing practical and financial support. How do you keep your staff as engaged as you personally during such a long-term project? BV: I have one rule in our firm: the best design idea stays in the project, and I don’t always have that idea. What’s really important to recognize about designing architecture at this scale is that you can’t do everything, so you need to attract talented people who are exceptional. This museum is in a really fluid state within the continuum of our practice, and with the extremely committed, talented team we have at the firm, it will hopefully be a remarkable project. Project Team: After winning the bid for the National World War II Museum, Voorsanger Architects, in New York, selected Mathes Brierre of New Orleans to join the firm in completing production documents and reviewing construction. The firm Voorsanger Mathes LLC is the architect of record as the phases are being completed. The campus for the $325 million master plan is located on 12 acres of property and is divided into four separate pavilions that, upon completion, will total 242,000 square feet. Here’s a look at each phase of the project. Completed in 2012, the Theater Pavilion—named the Solomon Victory Theater—includes a 250-seat 4-D theater with a 120-foot-wide screen. The fourth “D” refers to live-action effects that accompany the museum’s Tom Hanks-directed film. Also located in the pavilion is a USO performing area and a restaurant with a menu created by celebrity chef John Besh. With a half-acre footprint, this 100-foot-high building will be used to house authentic macro objects of World War II. B-29 bombers and fighter planes will be suspended from the ceiling, and the ground level will have tanks, war machines, and an interactive submarine exhibit. Adjacent to the Theater Pavilion, the Campaigns Pavilion will offer new, modern gallery space, easing the burden on the exhibition areas in the preexisting museum, the Louisiana Pavilion. The politics of World War II remain dynamic, and the Campaigns Pavilion will use static and interactive exhibits to examine the war from a range of angles.